Mix all crust ingredients together well. Press firmly into pie plate. Bake at 350 for 12 minutes. Let cool to room temperature. 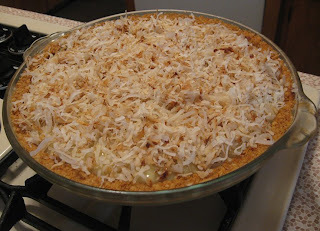 Slice bananas and place in a single layer on bottom of pie crust. Blend tofu in processor til smooth. Add choc chips to microwave safe bowl and microwave 2 minutes, stirring every 30 secs until smooth and melted. Pour melted chips into processor with the tofu and blend until completely incorporated. Pour this chocolate mixture into crust covering banana slices. Place in refrigerator and chill at least 2 hours or until set. When choc layer is almost set, begin making the pudding layer. Make pudding according to directions on box. (This should involve adding liquid to the mix and heating) *When making pudding for pies, I always use just a little more than half the liquid called for in directions. This makes a nice thick and flavorful pie filling. Remove pudding from stove and stir in 1/2 cup of shredded coconut. Allow pudding to cool to room temperature. Pour pudding on top of choc/banana layer. Chill. Toast shredded coconut in a skillet over med heat. Stir often and don't let it burn. Sprinkle on top of pie before serving. Macadamia nuts, bananas & coconut yummmy ... even tho' I don't like choclate that much, I am tempted to put in 2-4 ounces of those beloved morsels.